Beaches, relaxation. yummy food, family, reading, yummy food, sun, beverages, yummy food, and blog withdrawal. Did you notice how many times I said yummy food? I thought they were going to have to roll me home. Here is a picture before we got on the boat. I am loving how they made my sister squat down so I look taller! 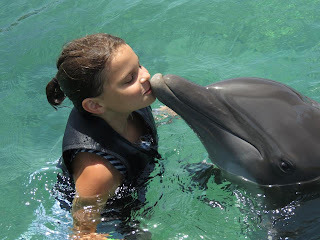 We swam with dolphins. This is my youngest niece Emma kissing Calypso the dolphin. We got home on Sunday and I think I left my brain on the boat! I usually avoid Wal-Mart but I have been REALLY scared to go because I am afraid I will see that they are starting to put out the school supplies...and I LOVE to buy school supplies. I would love to jump into the school as if 1 month of the year had already gone by. The first month is just exhausting...I feel like I reach my word limit for the day around noon. I am excited that we are having some BIG changes in our math curriculum. I have wanted to burn the majority of what we have been doing. As you might know, Texas is one of the few states that did not adopt the Common Core. We already have our own standards called the TEKS (We have TEKS for language arts, reading, science, social studies, art, technology, health, etc. These are for every grade level across the state). We have new math TEKS this year that have brought in standards that we were missing with the Common Core PLUS more. This is just a quick activity that you can do when you have a few minutes to spare or you can even use the plates as a transition to line kiddos up. This activity helps build number sense and number concepts. All you need are some plates and some dot stickers. My OCD did have trouble getting the dots to be even so it probably took me a wee bit longer to make. I also put a dot on the back of the plate to show which way is the top of the plate (I am not sure if this matters). There are 32 plates in all. Question of the Day: Do you do a scavenger hunt the first day of school? Would you be interested in me sharing a Pete the Cat or Kissing Hand scavenger hunt? I have been reading Van de Walle's book this summer. It is so full of ideas and information. I am loving it! A Pete the Cat scavenger hunt would be awesome. I was part of an action research project that used Van de Walle's book. Love it. I haven't ever done a scavenger hunt on the first day, but would be more than willing to give it a try! I read the Van de Walle book during my math methods course my senior year of college! It is full of great stuff! I would love to see your scavenger hunts for the first day of school!! Your Vacay sounds like it was fun!!! 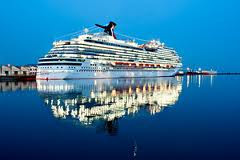 I will be leaving for a my cruise in a couple of weeks!!!! I think the scavenger hunt would be grade for the first day of school!!! I have used the plate activity, and the kids loved it. My sister and I went on a cruise in May out of Galveston, but we were on the Triumph. We're already planning another one. It was so much fun! Hi Heather I missed you:) I was so happy to see your photos from what looks like a great vacation! I actually wanted to do a scavenger hunt at the end of this school year but my brain was on overload and I was not my usual creative self. I would LOVE a scavenger hunt. Such a great idea! OOps forgot. Pete the Cat. Your cruise looks fabulous! Being a TX teacher too, I often wish we would adopt the common core. It seems very rigorous but appropriate based on what I have seen on blogs. That book looks great, by the way. I may have to invest in it. Heather, I just got off of the Carnival Fantasy this morning. I know what you mean...my head is still expecting the floor to do a gentle roll from side to side! 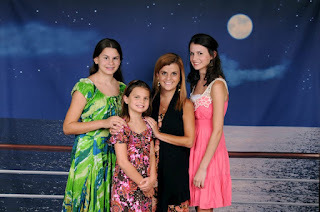 Our 1st cruise and we didn't break open the Dramamine. We had a terrific time and were treated like royalty. Now, it's time to seriously get these thousand school plans of mine in gear! Target already has their school supplies out and it sent me into overdrive. I went nuts!!! I love school supply shopping, always have! Thank you for sharing. These are great ideas. I have never done a scavenger hunt for the first day of school. It sounds fun! Seriously, you STILL don't show up in my reader. Ho hum...so I'm just going to get in the habit of peeking in here and there! Your cruise pictures look so fun, Heather. You're lucky to have such a loving family! I would love to take a gander at a scavenger hunt. I started one this morning actually, and then gave up. I have Van de Walle's 3-5 book (might be 4-6) and use a lot of stuff from it in my math program...makes so much more sense to me. I do a People Scavenger hunt the first day of school...it has thngs like "find a person who can touch their nose with their tongue" or "can speak another language besides English". I usually do it with the kids...it's great fun! Looks like you had a great vacation!! Yes Heather! I would love to know about your scavenger hunt ideas. I'm glad you got to get away on a cruise. Looks like it was super fun! Thanks for sharing that activity! The kids will love it! I love that book, it was my text book for my math class. It is an excellent resource and one of the few textbooks I actually kept. I just started following your blog as I am returning to the wonderful world of teaching after being a stay at home mom for the last 11 years. I love LOVE your sweet disposition and look forward to your new posts. I am so hopeful you will share (both really) but especially the kidding hand!! I know I will need a handful of kisses from my family for my first day back!! I am glad that you had a great time on the cruise. It looks like it was a lot of fun! Virginia doesn't follow Common Core either. We have the VA S.O.L.s (Standards of Learning). Although, from what I can tell, they are very similar. I have the Debbie Diller math station book, but not the other. It looks like I have another book to add to my wish list! I think either scavenger hunt would be neat. Thank you for sharing all the great ideas! Heather! It looks like you had a great time on your cruise!! I am looking forward to my vacay in 2 weeks!! I am interested in your math ideas!! I am going to check back often to see how things are going! Thanks for sharing! Joyfully! I have serious cruise envy! It looks like you had a terrific time. I have a Pete the Cat scavenger hunt that I can send you if you're still looking for one! Just send me your email if you'd like a copy. I have done scavenger hunts on the first day. Mine is usually chasing the gingerbread man around school. I would love to do something different and Pete the Cat has my vote! It looks like you had a wonderful vacation! And that book looks awesome... I might have to invest in it. I do not normally do a scavenger hunt, but was considering it this year. My vote is with Pete! I use the plates but never knew it came from the book. Our math coach made some of them for us but I don't have 32 plates only 10. I am going to have to invest in the book. I do have my students do a scavenger hunt to find certain materials and then we do a group scavenger hunt throughout the school to try and get them familiar with the school. They get a sticker every time we see or find something new. I would love a Pete the Cat one! Sounds like you had a great vacation! I'm also a Texas teacher and want to really learn the new TEKS to know what I'm really teaching. My school is signed up with that Project Share grant and I recently finished a book study through Region 4 online about numbers and numeration and it's got me thirsty for more. We were a reading first school so we know a lot about helping readers. Now it's time to tackle math. I would love to hear more on the Van de Walle book. I've got the Deb Diller book and really need to start dissecting that. I've also got the Conscious Discipline book and plan to hit that hard after I finish a GT book study for my GT requirements. So many books so little time! I'm soooo jealous! Your cruise looks fabulous and what a beautiful family you have Heather! We spent the past few weeks moving...in Arizona....in July! I am now fully baked to a crisp! I'm grateful to be settled at home before school starts though! I love all of your posts Heather and really look forward to reading them! Those pics are fabulous! Soooo jealous! 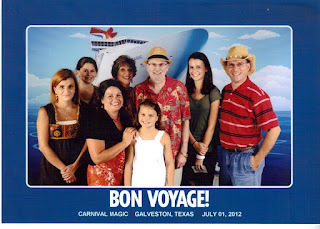 :) I went on a cruise once and always wanted to do it again. Love the number sense plates-always looking for ways to sneak math in wherever I can. Thanks for sharing! That cruise looks fantastic! Where did you go on it? This may sound a little silly, but what are you suppose to do with the plates? I haven't seen that book before. I did get the Debbie Diller Math Work Stations book. That one is good. I started reading it, but need to go back and keep thinking about it before school starts. Looks like you had a lovely time on your cruise! Hope you're having a terrific summer! Thanks for all of your wonderful comments!!! I really need help this year with classroom management. I have read Becky Bailey's book, I have read her LOVE Rituals book, I use her in my room, I have a heart with their pictures outside of the heart, and they put their picture in the heart as one of their routines each morning...Weblow a kiss to those who are absent...HOWEVER, what do you do for accountability? Last year I used the clip chart...students moving up and down the chart, but it just doesn't work for me...I keep forgetting to move kiddos up who are doing the right thing. I have a peace table, we work out problems, we talk about behavior, the kids determine their own rules, we talk about consequences TOGETHER...BUT, I sSTILL feel like something is missing!! HELP!! Do you have an overall management plan that you look at to see where students are at the end of the day? I am so confused!! Any help with this would be greatly appreciated!!! Oh, sorry, I would LOVE a Pete the Cat Scavenger hunt!!! HE was our mascot last year, and I plan on continuing the tradition!! Your blog is so cute and inspiring! It is great to see other teachers who believe to see the best in students and the power of God! I love that you have FROGs in your classroom to remind you to always rely on Him! I am your newest follower! Of course I would love a scavenger hunt for back to school!! I just nominated you for the "Versatile Blogger" Award. Stop by my blog and pick up your award. Love love love your blog! Thanks for inviting me to stop by and join in the conversation! I taught in El Paso, Texas for eight years at the start of my career and loved every second in Ysleta. For as much as the nation is going ga-ga over the CCSS, I find myself missing the ease of the TEKS. When I left, there were 6 reading and 13 math (and I can still recite all of these from memory). The CCSS are a far cry better than most states had, but they are still not necessarily easy to use and remember. Also...love the fact that your district is taking a very progressive approach in Math. Diller's book and Van de Walles book are both exceptional resources. I'm so excited for you and your colleagues! Love the ideas you are sharing...I'll be back! I am so excited to read your blog today. My family are setting sail on the Magic a week from this Sunday. Your pictures gave me goose bumps I am so excited. While you were taking in the refreshing sea breeze the school supplies were being stocked :-( I have been busy making stuff for my classroom so the vacay will be needed. Glad you had a good time, maybe I will post some pics on my blog (I am just starting). Thanks! Glad you had a good time on the cruise! Thanks for visiting my new blog! I'm returning the favor and am now a follower of your site!! Heather, thanks so much for stopping by my blogging and leaving such a sweet note. I am now your newest follower. :) Your cruise looked like you had so much fun. We do a gingerbread hunt the first day. I've always wanted to make it more of a scavenger hunt instead of the free for all it is. I'd love to see your ideas. LOVE your blog! Cuteness x 1,000! Thank you so much for stopping by my blog. I'm sure in all your awesomeness you've already received The Versatile Blog award but if not, stop by my page to pick it up! Looks like you had a blast on your trip!! I love going on cruises (except for in the winter, I get sea sickness then)! I think a scavenger hunt would be a great way to begin the year! Love your blog! I am giving you the One Lovely Blog Award. Pop over to my blog to find out about the award. Looking forward to see what your class is up to this year. I usually do a scavenger hunt, but never thought of doing it with a book. Great idea! I would love that! I just started following your blog. You have great ideas! I am new to your blog but love the ideas I see. A few of my friends have pinned some of your work too. FUN!!! I use a scavenger hunt -- a gingerbread man one. WOuld love to see a Pete the Cat one to shake it up a bit!!! Heather, I'm glad you had a wonderful time! I just returned from a beach vacation, and it is certainly a rude awakening. :) I stopped by to let you know I've nominated you for 2 awards. Stop by my blog anytime to pick them up! Hi Heather! I'm your newest follower! Last year I did a scavenger hunt/checklist at Meet the Teacher. I'd love to see the scavenger hunt that you have! Pete the Cat! Pete the Cat! Oh, coming back from cruising is always so hard. They spoil you so much! Thanks for all the freebies and reminders! What a fun vacation! I had never thought of tying a scavenger hunt to a book. What fun! I don't do a scavenger hunt on the first day of school, but think it would be such a fun way to get the new year rolling. Please keep me updated on more if you choose to create/share something! I do a scavenger hunt on Meet the Teacher Day. Since I have Kindergarten students I think it is easier to complete the scavenger hunt with help from their parents. It also allows the parents and the students a time to get comfortable with my classroom. Part of my scavenger hunt includes finding their name at their seat, on the job board and the place where they hang their backpacks. Thanks for stopping by my blog and becoming my newest follower. I too love your blog! Don't you just love the Van de Walle book. I have it and I also have Elementary and Middle School School Mathematics. This book is basically the complete set of the grade level books. I have the Texas edition which has the activities aligned to the TEKS. (Old ones now, but still useful. )I know you have received this before, but I have left you the Versatile Blogger Award as a thank you for all of the wonderful ideas that you share on your fantastic blog. Please visit mrsrhodesscholars.blogspot.com to accept your award. So glad to FINALLY see your wonderful blog and get to know a little about you! Stop by my blog anytime! I just wanted to let you know that I nominated you for a Versatile Blogger award! I love to cruise! Looks like you had a great time! Super cute blog! I enjoyed reading everything! I am your newest follower! I just bought a stuffed Pete and plan to do some activities that first week - so a scavenger hunt might be fun! I also bought Conscious Discipline - I'll look forward to your posts. Heather, just started following you! 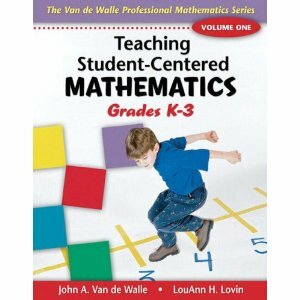 I teacher third grade in Arkansas, and while we are adopting the Common Core Standards, we are also using the Student-Centered math book by Van der Walle in our Math curriculum. What about your curriculum is changing? I am very excited about math this year--I have so many new games to incorporate... If only I had unlimited card stock, color ink, and lamination!! I just got back from a cruise, too! I hope you loved yours as much as I did mine - and we used that book (Teaching Student-Centered Mathematics K-3) in my college courses! How funny - connections! That van de walle book is the bomb! It's soooo great! Thanks for stopping by again! Yes! I gave my sweet little blog a makeover to accompany my new overall classroom theme for the year: SAFARI! That was one of my first posts that you just commented on and my classroom will be getting a makeover too! Stay tuned for new pics of my class! You'll have to wait until mid august though because I only return on the 24th! Thanks for your sweet words! Your blog is awesome! P.S. I'm going on a cruise too! In Spain! Looks like you had a blast! Oooh, the cruise likes like it was a lot of fun. My firsties looove Pete the Cat, so I'd be interested in that scavenger hunt. Alice @Crayons in the City. Thanks for visiting my blog. :) It looks like you had an AMAZING cruise! What a great family trip! I'm your newest follower on your great blog! I have just found your blog and I love it! Please share your scavenger hunt!! Wow! No CCSS for you guys, huh? I guess the TEKS must be pretty good! I'm in NC and we did just adopt the CCSS. The changes start this year. It's only my 2nd year teaching so it's not too drastic of a change for me. I know some teachers are freaking out about having to switch. It's different from what we are doing now and I love that it seems more challenging! Our kinder teachers do a scavenger hunt with the GingerbreAd boy books. But I would love the Kissing Hand or Pete!! I must've got on the Magic the day you got off!! Dang, I would've loved to have met you...I looove your blog! I really really want to read the K-3 student centered math book! It looks awesome! Thanks for sharing a strategy from it! Your cruise pictures look awesome! Swimming with dolphins would be amazing. Really want a cruise vacation in the near future. I am voting for a Pete the Cat scavenger hunt! Would LOVE that! Thank you for sharing. In response to your question of the day for July 10 about scavenger hunts. I would like one for Kissing Hand with explanation of how to have one. Thanks Love your blog. Super cute blog. I am a new follower! Is Your Heart in Your Room?